Coffeespot.bg is a huge online store offering a wide variety of goods. At a time when online merchants have 3 seconds to present themselves and impress the customer, the content of so many products in one place can be a problem. Following the latest web design trends, we made a wider store slider and duplicated the main categories through banners on the homepage. We removed elements that made customers’ orientation difficult. We’ve merged certain categories to improve the web site’s navigation. In the same time, we kept the URLs of all website pages so not to lose the positive SEO results. We improved the product page design, removed unnecessary elements, ameliorated the product presentation, and restructured the filters. 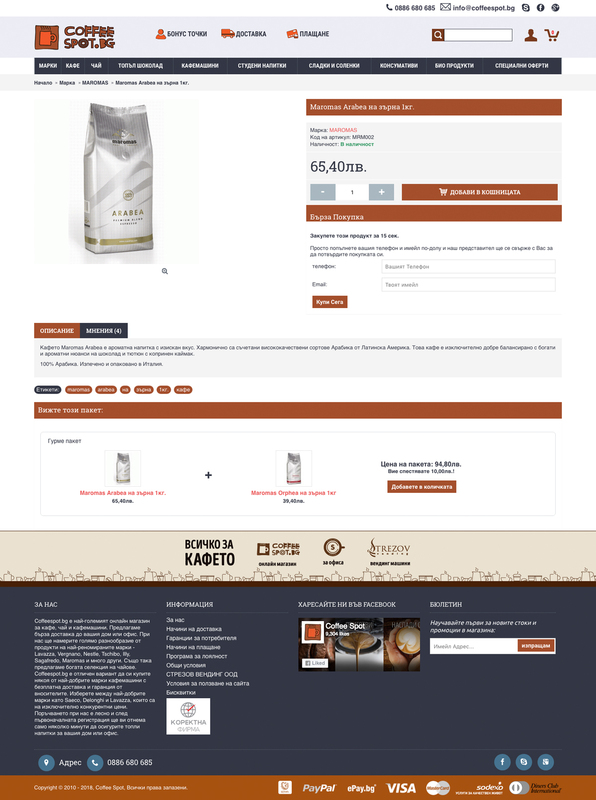 Thus, customers of Coffespot.bg can now buy their favorite products much faster and easier.